Yep, summer is almost over and fall is on the way. Before you know it, the holiday season will be knocking on our door. For us, this means squeezing into last year’s holiday party apparel. Is there ever a time when we aren’t trying to diet? This recipe is the ideal mix-up to your salad routine. Since you have been so good about sticking to your diet, we have decided that you deserve a little treat with a slice of bread and a little sweet honey. Indulge yourself, with a glass of wine, on a Friday night. Trust us - it will be the perfect ending to a long week. Oh, and I know you’re about to question the wine. Well, in moderation, red wine is proven to be good for your heart. Drink up, doctors’ orders. Here are a few additional tips for this recipe. Bread: I served this recipe two ways: I cut part of the bread length wise (like a French bread pizza) and I sliced them into small rounds (to make bite sized crostinis). You can also use just about any crusty bread. Apples: Granny smith or summer rambo will work perfectly, however, if you prefer a softer apple such as red delicious, feel free to swap them out. Honey: Use whatever variety you have on hand or prefer. We prefer the taste of a wildflower honey, such as clover honey. Feel free to experiment and be your own chef. Over low heat, melt butter with a drizzle of olive oil. The olive oil will prevent the butter from browning. Add in parsley, rosemary, red pepper, and a pinch of salt and pepper. Allow the flavors to combine. Using a mandolin or sharp knife, slice your apple and cucumber length wise. This will give your cucumber slices the shape of planks and your apple slices a round shape. Preheat your grill or indoor grill pan on medium heat. Slice your bread and brush each side with the olive oil / butter mixture. Grill the bread on each side for 4-6 minutes, until you have grill lines. While you wait on your “crust”, prepare the salad topping. Place the lemon juice in a small prep bowl, whisk in an equal amount of oil olive, a drizzle of honey, and a pinch of salt and pepper. Add in your spring salad mix and toss to combine. Pull your “crust” off the grill. Spread equal parts of the goat cheese on each slice or round. 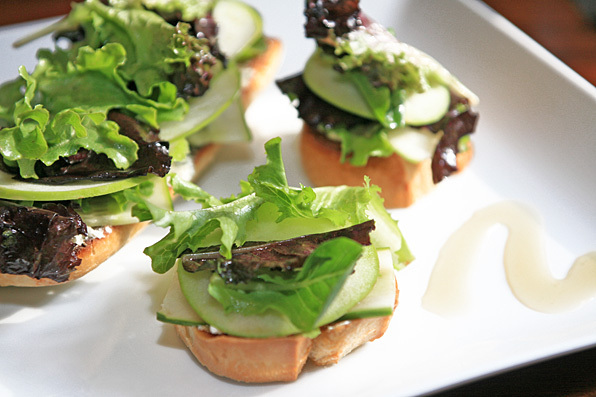 Add a drizzle of honey and top with cucumber slices. Finish by arranging dressed salad mix, layering slices of apple in between. This is really, really good. The honey and goat cheese go well together. It took me a long time to search for good recipes on the net. Only your site explains the recipes in a way I can understand. These crostinis look so fresh and great! Simply right up my alley.